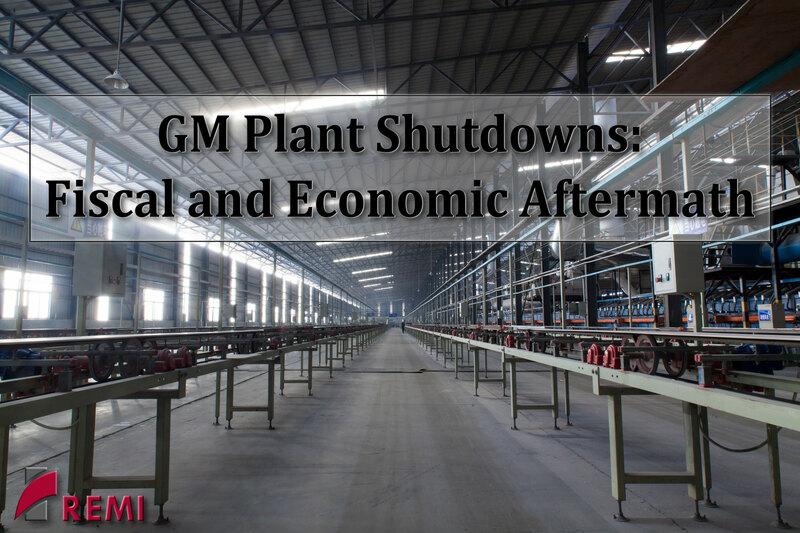 General Motors’ plan to shut down production at five North American facilities is painful news to the communities directly affected by the decision. Furthermore, any major round of layoffs or plant closures such as these can result in economic and fiscal consequences for the impacted states. As part of a broad restructuring, the auto manufacturer announced it will idle facilities located in Michigan, Ohio, Maryland, and Ontario, Canada while reducing its total workforce by 15 percent. REMI cordially invites you to a special webinar presentation on Tuesday, December 18th from 2 to 3 p.m. EST, when Senior Economist Peter Evangelakis, Ph.D. will discuss how to assess the repercussions. This webinar demonstrates how fiscal and economic analysis can help policy makers plan ahead in the aftermath of major shocks. For his presentation, Dr. Evangelakis will focus on the case of Michigan, which is home to two of the five facilities slated for shutdown. He will evaluate the broader impacts to the state’s employment and output, as well as estimate the implications for state tax revenue using REMI’s Tax-PI fiscal modeling software. Please contact us at info@remi.com. Copyright © 2017. Regional Economic Models, Inc.